December » 2011 » Harrumph! In this season of annual-updated, photo-illustrated family letters, let us praise the continuing migration of the most relentless of beasts — the cute and personal LITE. Many under 30 escaped some migratory stages, but the herd of pseudo-candid will continue to seek new homes. We for­get JUST how utterly time-consuming blog­ging used to be, back when it was the only game in town. 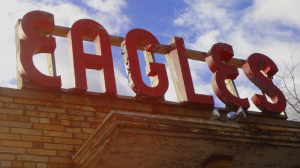 I remem­ber the early blog­ging days, don’t you? Remem­ber how kee­ping up with the blo­gosphere pro­perly took ten hours a day? Nowa­days, the only peo­ple who are left blog­ging are the peo­ple who REALLY want to, who ACTUALLY have something to say. Ever­yone else is uploa­ding cat pho­tos on Face­book. I think this is a good thing. Yes, mimeographed (look it up) annual holiday letters preceded photocopied ones. They came before the dreaded desktop publishing (young’uns may need to look that up as well). DTP all too clearly proved the poverty of the typical intellect, imagination and artistry. Putting layout, illustration and typography options at the disposal of the masses produced millions of newsletters and personal epistles in what is known derisively in journalism circles as circus layout (alluding to Ringling Bros. posters). It seems everyone felt their most trivial thoughts were brilliant and worthy of circulation when there was enough variations on fonts and type sizes. How could everyone else not realized how handsome and clever were their children, pets, houses, and on and on? Along came the World Wide Web, which most folk use synonymously with the internet. A decade latter, it was blogs. They were the new habitat of the cute and cluttered herd. Along came variations and most notably Facebook, as gapingvoid’s Huge MacLeod noted. There’s a home for all-too-easy display of cute kids and kittens, leading to a herd migration from blogs. Now those who need to show their beloved beings, or every meal they eat (seemingly in purple and black tones of unappetizing low quality), do so nearly instantaneously on FB. Certainly a very positive outcome of this migration is that finding and keeping up with relevant and meaningful blogs has gotten easier. Many of the regularly updated ones are far more likely to feature news and views, and not furry, drooling or pasted-smile loved ones. #1 Son gifted me a splendid biking jersey. 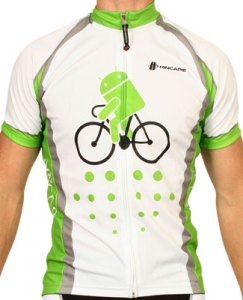 It’s from his company’s store, replete with the Google Android bot biking. He’ll have to upsize it. He asked last night when he called whether it fit, adding that he worked next to where the Google store is. I thought it would, after all reading XL in the tag. Hmmm, not so. I tried this morning and it didn’t go over my large-animal shoulders, much less cover the ox-like chest. XL, you say? It turns out to be the cycling/European jest. If you put a Tour or Giro rider next to a man of human proportion, you’ll see the model here. Professional riders tend to be short and extremely thin, ectomorphic types. Ever gram they carry on their body and bike is more inertia to overcome climbing mountains or pushing for fractions of a second in a time trial. As long as they don’t faint, they alone can’t be too thin. That shows my prejudice. I know you can be too thin. The touchstone for many woman was Nancy Reagan, who was so frail and wispy that she was treated for anemia for decades. The heroin-addict model look and the androgynous clothes horses do and should creep out healthy people who got the right natural hormones during puberty. For me, I’ll go with a woman like my wife, with real hips and actual breasts. Pointy pelvic bones are dangerous! So what was an XL in this jersey? Well, first keep in mind that these jerseys are made to wick away sweat. So, they are to be skintight. Moreover, they are in the European style, with accurate measurements. That is, American clothiers are generous. Women in particular like those impossible sizes of 0 and 2, so the makers of high-end women’s dresses tend to mark a size 8 or 10 with a 4 or even a 2, to allow for enough delusion to inspire whipping out the charge card. Men don’t quite get that, but there’s a two-inch sponge. A man’s 34 trousers are for a 36-inch waist and a 42 sports jacket is for a 44-inch chest. Not so with cycling jerseys. Inches are inches and centimeters centimeters. Combined with the sprayed-on effect, it makes for amusing letters. Looking at the Google store for U.S. customers, you can see first, pix of employees of various somatotypes and sizes, and second, the amusing size charts for men. For the latter, pants seem reasonable, where a large is large. Shirts on the other hand are European. An L can be 40, XL 42, 2XL 44 and 3XL 46. Each allows a two-inch range. I inherited big honking bones from my maternal grandmother. Even docs have said in effect, “Jesus, your bones are big!” I come with big feet (size 13), shoulders like a draft horse, and a 48-inch chest — 3 inches bigger expanded. Those are professional heavyweight boxer specs. I don’t recall anyone ever calling me dainty. I’m used to XL shirts and buying 46 American or 48 Brit/European suit and sport jackets, altered down in the waist. Sometimes, well-meaning relatives who think of me as this cartoonishly large-shouldered critter have wrapped up 2XL or 3XL shirts, which I could wear as a tarp or tent. Those are actually made for 400-pound porkers. Yet, here I am, looking at the Google store and seeing that their largest size in a cycling jersey, this one I really like is in fact a 3XL. That’s for chest sizes 46 to 48. So the maximum is sized so that I should be able to jam myself into it at the top of its range. A good change here since I was in high school and college is that such fun and colorful shirts are available at all. Plus, they are not limited to M, medium. Back then, we athletes groused among each other that we had damned little choice in clothes. However, it’s going to take a meditative moment to assimilate the reality that in this particular line of cycling jersey, I’m 3XL. What’s in a name? What’s in a number? I’m not huge on magical numbers, good or bad. There are primes I simply like the look of, like 17, but I don’t ascribe power to any set of integers. That written, a few coincidences have been obvious in my family. There’s the space of 24 for one. 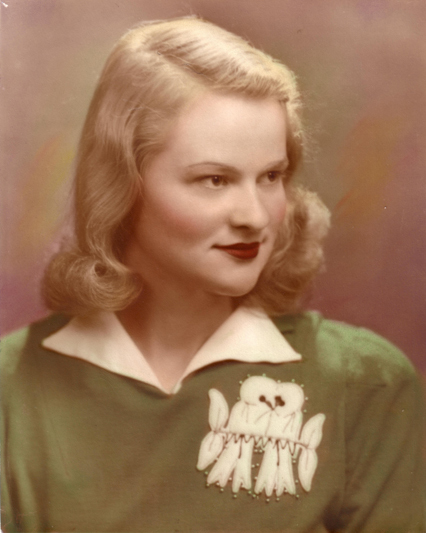 My mother’s father was 24 when she was born, as she was 24 when I was born. That certainly came to mind when a women I was living with became pregnant when I was 23. Had she not had an abortion, over my objection, I would have been a dad at 24. I did not even think keeping the series running. Yet in retrospect, I was not mature enough to be a dad then, and maybe barely when my first son was born when I was just short of 31. Now 54 wasn’t all that remarkable for me, but for both Granddad and Mother, it was intense…24 years apart. Granddad found agony, tedium and enlightenment. Mother was physically, financially, emotionally and even geographically upended, with some permanent negative effects. For them, 54 was a very big deal. At 54, Granddad had forced prolonged meditation. He found enlightenment in the backyard on South Marsham Street in Romney, WV. He was in a cast from one heel to his waist. Though a railroad yard foreman, he was impatient when his crew could not uncouple a pair of recalcitrant train cars. In the process he fell between them and found his leg and pelvis crunched, broken in three or four places (I forget the detail). While healing and immobilized, he would hobble on crutches to the yard and read under the gigantic maple tree. He went through the perhaps 100 or more books in the house, all of the Reader’s Digest copies they’d kept for decades, and some public-library books that his wife brought home. He planned his vegetable and flower gardens and enjoyed the small plots in the back. Then he thought. Years later, I asked him about his calmness confronted with difficult people (often my grandmother, his wife). As it turns out, he was dying when I brought that up when he was in the VA hospital for a double hernia operation. I had no inkling that the post-operative effects included some floating blood clots that did him in shortly after. For many reasons, I’m glad we had the conversation. He first smiled the gentle, beatific grin I associated with him — all kindness and humility. He said that his calmness was relatively recent. It turns out that it happened when he was 54 and confined to the yard. After exhausting the reading material and his desire to divert himself through print, he mused. He would think and feel with open or closed eyes. He said those years later that it just came to him one day, both intellectually and emotionally. Somethings mattered and other things did not. If his wife or someone on his crew or another in a story said or did something nasty, it did not affect him, not in anger or spite or sorrow or any other negative way. He said it really wasn’t a mental decision so much as an awareness. Since that moment, he lived that. So there was my 70-something Granddad saying (in my words) that he had an enlightenment at 54. For me, struggling with my own adulthood and not so calm in the presence and actions and words of difficult people, I had a sense of relief as I digested this lawn magic. I had long emulated and admired him, but did not see a path to his equanimity. That was particularly important as he played the father role for me. My parents had divorced and my father and his almost immediate second wife went off to Germany, had a couple of sons, skipped on required support payments (the Army would not enforce the court ruling) and did not contact me for 20 years. So Granddad was it and he did a fine job…other than being an impossible role model. After our conversation about the backyard awareness, I came to see that he was not only 48 years more mature but that he had also arrived at a place most of us never do. So, I could relax a bit and stumble (with some of my own meditation) along finding my own manhood, husband role, fatherhood and work interactions. Whew. She and a lover were very happy with each other in every sense. Then his ex-wife started a new court action, wanting double alimony and child support. He flipped and fled to someplace like Singapore to wash that wife out of his hair. Wanda was suddenly solo, from joy to loneliness. Her pharmaceutical employer sold itself to pharma giant Schering-Plough, which in effect said, “Love your gynecological products, but we have a sales force.” They gave each rep a bag of money and a bum’s rush. She found herself unemployed, with six months to invest that money or lose much of it to taxes, and in effect forced to activate her eventual plan to move to Santa Fe to retire with her sister (head nurse at the Indian hospital) over a decade before she wanted to do so. She found a lump in a breast, which turned out to be malignant and affecting lymph nodes as well. She was likely to die shortly. She flew to Santa Fe, where a trusted surgeon friend of her sister Peg did a radical mastectomy/lymphectomy. Then she returned home with half a concave chest and a course of toxic chemo and radiation in the works. She was supposed to die within five years, in the spin-the-wheel medical odds game. As medical wisdom (oxymoron) had it at the time, cancer for a middle-aged woman meant stopping all hormones immediately. She had experienced a strong menopause, and as a result other medical wisdom had her taking lots of hormones. The sudden halt brought a personality change, a negative one, in which my ever objective and patient mom became, to hear my chums and coworkers tell it, just like their moms — short-tempered, sharp-tongued, fault-finding, and even politically conservative. She (rather we, as my 7-month pregnant wife and I loaded up her physical world in Pittsburgh into a U-Haul truck and led her in her car to Santa Fe, to the house she bought with the money for the two of them) went in great distress to a future seemingly out of her control. As she settled in, my sister and her daughter figured this was a great time to leave her bad marriage. She showed up with two young kids. And baby makes five. Granddad had a much better 54 than Mother did. A funny confluence today was a YouTube share on FB of the Waitresses’ I Know What Boys Like. That, of course, was sexual innuendo, but there’s something else boys and men like. That came in news short about Dig This in Las Vegas. Boys and men, and some women, like or love construction equipment. The new big-boy playground in Nevada likely appeals even more to guys than driving fast cars does. Pretty much anyone with a credit card can do that. However, watch boys and men as they stare and gape at track mounted motorized tractors (bulldozers to you) and hydraulic excavators. They’re likely to make engine noises while looking too. At a couple points in the early 1970s when I moved to NYC, I verified that love of huge machines two ways. First, I was along-term temp at MOMA, including working with then Curator of Design Emilio Ambasz. I also got a full-time job later writing for Construction Equipment magazine. While at MOMA, my main job was as a lackey while he brought the Italian design show (Italy: The New Domestic Landscape) to life. That was great fun getting to work with the brilliant designer and the steady flow of Italian creatives. Beyond that though, I got excited enough to pitch him an idea for making an extensions-of-man exhibit, perhaps in Central Park. I saw everything from prostheses to earth movers. People would be able to be fitted with or use these, anything that amplified or corrected human bodies. Ambasz professed to like the concept and we spoke of it repeatedly. In the end though, he didn’t want to own it, suggested I strike out on my own and make it happen, and negotiate with manufacturers and bureaucrats to handle the logistics, particularly the huge insurance issues inherent in letting plain folk handle gigantic machinery. As the new kid, I had to handle the complex nationwide directory of equipment, bringing it from index cards to computer. I got to apply my journalism studies and newspaper experience to investigative pieces that that the engineers were not comfortable doing. Yet, John was also true to his word and taught me construction as well as sending me on job sites. In was on the stories of dam projects and the like that I learned that heavy equipment brought out the boys in even the most experienced men. The guys who run those tower cranes, excavators, earth movers far too big to fit in the bulldozer category and more make the noises. Put them in the cabs of the most powerful machines and they are boys again, playing with construction toys, except those aren’t toys anymore. Actually it was endearing to see and hear the tough and tanned heavy equipment operators having so much fun even after years doing it. They talked about their rigs the way kids do their toys. As for the extensions-of-man show, John too was intrigued. He also ran through all the complexities to get it done, but thought it possible. Unfortunately, I was in my early 20s and did not have the experience or entrepreneurial bent to go after it. Then Construction Equipment moved to Chicago from across from the Daily News and I had little interest in going with it, leaving Manhattan. Shortly after, John, only in his 40s, got virulent cancer and died. It was a good idea. Even in its very lesser form in Las Vegas, that subset is also a good idea. Next time I’m out that way, I’ll Dig This. Two friends whom I’ve enjoyed and admired for decades died within a few days of each other last week, one in the Boston area and one in Mexico. They were in their 90s. More than knowing each other, they shared the essence of Unitarian Universalism. That is, Virginia Wheelwright and Dan Cheever were not checkbook dogooders. They used their energy, time, best efforts and ideas to make life better for others. For those of us familiar with their good examples and good deeds, they didn’t live long enough. Both Dan and Virginia made things better for people they knew, for those they hadn’t met yet, and those they’d never come in contact with. They seemed incapable of any other way of living. Dan (who did not use his PhD “Dr.” or day-job “Professor” titles away from BU) was a high-level secret Santa as well as concerned manager. In his largess distribution at the ASC and beyond, he did not ask for, nor expect, nor want praise or acknowledgment. Perhaps the minister or music director might thank him privately for his sharing of wealth, gifts that often kept programs running or starting. Moreover, I am sure that the ASC might well have closed shop were it not for his guidance when he chaired the board, with its loaded, old-style name of the Prudential Committee. Along with decades of volunteer work, he had to manage groups and departments as professor at both BU and the University of Pittsburgh. He brought academic and management smarts to bear, along with his considerable personal financial savvy. Known to many as either the mother church of Unitarianism or the UUA chapel, for the many staff members and ministers from 25 Beacon who attend, the ASC not all that long ago was a physical and financial mess. It could well have gone down. Not even the 999 wood pilings that keep it from sinking in the Back Bay would have been able to keep it figuratively afloat. After and while reconstituting the church’s personnel committee, I worked closely with Dan as he served two years as Pru chair and still drew on him for the next two years I was chair. I would joke darkly with him and interim minister Farley Wheelwright (Virginia’s husband) that I should come to the building wearing a cowl and carrying an ax. I had the messy job of clearing out the dysfunctional staff, creating workable job descriptions, and helping Dan figure out how we could pay a decent wage. The ASC was so broke that the UUA subsidized the minister’s salary. In ways, Dan was an anachronism, a true gentleman. In such a trying time and place, and dealing with the frictions and egos of volunteers, Dan was thorough but endlessly patient. In years of dealing with difficult people, he never seemed to yell or even snap. Our board meetings might run five or six hours. We dealt with big issues, the future of the church paramount. Chair Cheever polled us all around the table on the big issues, he demanded both our best thoughts and our buy-in for the eventual decisions. He of course had done serious research and brought out possibilities that put the overwhelming within reach. He got us thinking and acting right. In the end the ASC was prepared financially and in systems for the new and charismatic new minister, Kim Crawford Harvie. She’s been there and the church has flourished in recent decades in no small part because of the preparation. Virginia came in and out. She and Farley remained members after his interim ministry. They ended up in San Miguel de Allende, Mexico. I had a very different, much closer relationship with them. We dined together at our houses and at restaurants. We then always were together when they visited Boston and we kept regular contact by email and phone. Even before Farley took the spot at the ASC, Virginia had been a social activist. She served on many levels in UU organizations operating internationally, nationally and locally. Yet, the activism that may best define her started in Mexico when they allegedly were retired — neither Farley nor Virginia knew how to do that. Virginia founded and at various points was president and other officers at Jovenes Adelante, which had drastically improved lives of the young and bright around her. As she noted, it started when she and a friend heard that a lad headed to college did not even have enough money to buy a pair of shoes to attend. Getting him shoes grew into an organization that raises the money to identify promising students, ensure they finish secondary school, and pay for college for them. Hundreds of youth have benefited, and of course, their families and towns have as well. Virginia too didn’t know how to throw up her hands or just shrug. The impossible took a little longer for both her and Dan. We lesser mortals may gape at antiquities in museums, squinting at the plaques, straining to recall our history lessons, and generally marveling at the artistry of the potters and sculptors. Others know potential profit when they approach it. In today’s FT Wealth maggy, the mindset of collectors, dealers and museums is the cover story. As it turns out, we have been distracted by the past few decades of tales of tainted treasures. Countries and some individuals have worked to get back looted, stolen or smuggled works. Folk concerned with the money aspect above all understand the implications. For centuries, museums and rich collectors rubbed the spoils of Colonialism and conquest. They’d haughtily proclaim they were the rightful, righteous guardians of treasures that would be lost otherwise. As others began to track the routes of various statues and such, they found less honorable provenance for many. We’ve been slowly learning of various artifacts and art returned to wronged owners. The business angle? The FT turns to Christian Levett, a hedge-fund founder whose museum displays his collection of antiquities. He says provenance is the key differentiator now. For tax evasion or less nefarious reasons, ownership paper trails on many objects are scant or none. He claim to buy only with verifiable info. The dubious works are always at risk. Check the paperwork before writing that multimillion dollar check. You are currently browsing the Harrumph! blog archives for December, 2011.